Now I aim to dive every month as every diver should be. And I have few plans as I begin for another diving year, schedules and preparations were put to order. 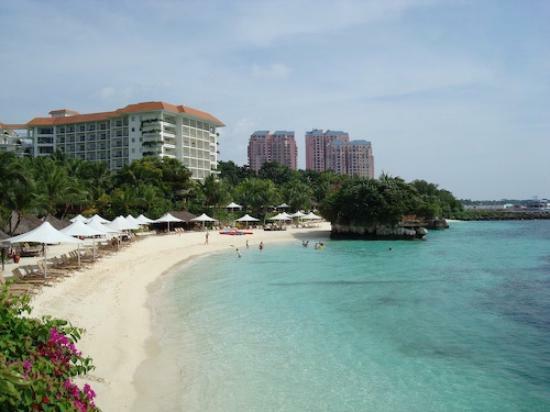 My mind thinking to mix some pleasure while on a work trip to Cebu but it turned out the conference was cancelled, and the final venue is not close to the waters. I became restless and alternately devised another trip plan. Surprisingly, Angel invited me to join him in Mactan over a weekend suggesting for a dive. I was ecstatic and grateful, it was just perfect as a start for diving pursuits with my favorite dive buddy. The next thing I did was made myself free on the weekend, bought my tickets, and work harder to put things in order before getting some leisure. The week has been full at work, and on Friday I was running for meetings. But the thought of weekend lifted my spirits, and I could almost smell the sea waters. 🙂 My Saturday mornings has been reserved for early walks but I was up very much earlier as usual to catch my flight. And the usual sneak-while-everyone-still-asleep thrilled me once more! It was a crisp morning and the cold winds embraced me as we boarded the plane, the horizon promising a sunny day. The flight was smooth and just like with my previous Cebu Pacific flights we touched down Mactan International Airport earlier than schedule. The skies were downcast but hoping there would be no rains during our dives. Everything is pink as I stepped down from the taxi, after some preliminaries at the front desk I shoot up to 22nd floor, buzzed Room 2203 and sadly woke up Angel who barely slept 3 hours. 😦 He was still in stupor as he let me in. 😛 I reached out to the terrace and watched the morning horizons overlooking the beach, calm crystal waters and green vegetations yonder. It was almost two months from our last trip and so there were catch up stories to tell, then went down to Vanilla Beach Café for a sumptuous breakfast. I watched in awe of the abundance of food, all free! But I needed a light meal for my dive, Angel wanted to try everything he fancied with! 😛 I love long breakfasts with stories but we need to rush to Maribago beach for the dives, we are expected at 10am. For some adventure and to save transportation costs, we chose to commute to Kontiki Divers. After a wrong stop, few inquiries and 200 m walk, we reached the diveshop on time. Ms Diana was out there to welcome and introduce us to DM Julian, it was some kind of exclusive dive for us – no other divers to join us! Without delay, we went off to the shore for the diving boat – alas, it was high tide and we need to wade in the waters! We discovered that there was lot of resorts lining up the beach which includes the Maribago Blue Waters. Our first stop was Agus Bay, we descend on a sandy area then getting deeper to a wall with reefs. It felt good to be back in the depths, so relaxing – indeed a second home. We drifted watching the scenery, there is really something peaceful with the fishes. There were damsels, fusiliers, variety of anthias, banners, variety of angels, some butterfly, lionfish and more. There were gorgonians I passed by trying to look closely for macros. But alas, I forgot to put on my contacts! 😛 I planned to have it when I got to the hotel but simply slip from my mind. There were bubble corals, tubes, some table but no sponges. I tried to touch something that looks like sea cucumber but turn out to be a hard coral. There were few nudis and pelagics were nowhere. After 48 mins with 27.8m as deepest we surfaced near Maribago Blue Waters, the boat waiting to pick us up. After an hour of interval, we descend at Marine Station limiting to 25m deepest according to DM Julian. It was sandy slope until we went deeper to a wall covered with reefs. There were seafans in green, yellow, brownish and lavender. Bubble corals were abundant, some crinoids and variety of hard corals. There were, damsels, moorish idol, butterfly, angels, groupers, lionfish, anthias and more. We were stunned when a large school of medium-sized bluefin trevally appeared before us! It darkened our view but was truly mesmerized with this wonderful display of creation, about tens of thousands of them. So near to us as we drifted on and passed us by. As we get shallower we went east and found the crane artificial reef which is now fully covered with corals. I found lot of fishes nearby including my favorite puffer fish. We drifted shallower until we had our safety stop, we linger more and hopped on the corals until we surfaced right on the concrete steps of Club Kontiki. We were 48 mins down and went 22.8m as our deepest. It was already past 2pm and so we ran out of time for third dive as we wanted. After a coffee break and some pleasantries with Ms Diana, we settled our bills and rushed back to the hotel – grateful it wasn’t drizzling anymore. The next morning we went to hear mass at Sto. Nino Mactan in Visayan, decided to walk back to the hotel but when we passed Mactan Shrine we went to take a look. It has an obelisk (! ), a large mural of Mactan Battle, monument of Lapu-Lapu, some souvenir shops and park. And there were Korean tourists geting around in the park with matching guide. Passing Shangri-La, a bit farther we dropped by at Scubaworld Diveshop – had a brief chat with the shop manager (a diver perhaps), and bought some dive supplies – I was looking for beanie hood but not available. After a few meters, we finally got to the hotel entrance. We’re famished already and so went straight to Vanilla Beach for our sumptuous brunch. Again I was overwhelmed of the abundance when there’s so much people out there who have nothing to eat! We rushed and shoot up to 22nd floor for the last time – to freshen up and finally pack up. Last few minutes in this luxurious trance. After some clearance at the front desk, we took a cab to airport leaving our pink abode behind us. Such a wonderful experience, I wouldn’t splurge my hard earned peso just to spend a night in this kind of lavishness. It was such an honor that Angel shared this luxury treat with me. Pingback: Mad about Moalboal! « Life Beyond the Depths!